Big, small, skinny or an in-between. It doesn't matter the size or type of dog. If you've noticed your best friend having problems with daily walks... going up or down the stairs... or struggling to hop up on your lap or next to you on the couch... you wish to do something about it. 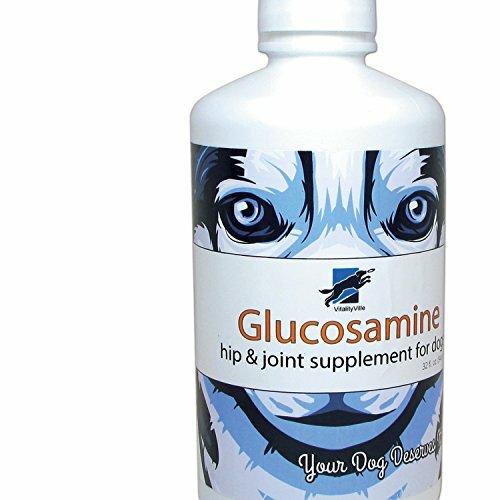 Whether inquiring from your vet or doing your own research, you likely discovered that it's worth a shot to try a Glucosamine / Chondroitin supplement. What type of supplement should you choose though - liquid, chewable, tablet? Most pet owners find that a liquid is the easiest to administer and the quickest to absorb. That's what you have here when you order from us today. After your purchase today, if you need anything from us just let us know - we're a small family owned business that relies heavily on satisfied customers and word of mouth! If your dog has had joint pain, arthritis or other impairments that limit movement and create pain you probably took your pet to the vet. And its likely the vet recommended a glucosamine with chondroitin and MSN supplement. These supplements typically come in three forms liquid, chewable or tablets. If you notice, ours is a 32 oz. liquid thats because we find for most dogs its the easiest to administer and the quickest to absorb. This special formula is good for dogs of all sizes. See our image for the exact dosage you should provide based on the size of your dog. Some clients report almost immediate results as soon as they use the VitalityVille Glucosamine Supplement however it does depend on the dog. We are confident any dog will see marked improvement over time. We back this confidence with a risk free, no questions asked satisfaction guarantee. Try it today and see for yourself. We are real people ourselves, so after your purchase if you need anything let us know one of the owners will respond personally! If you have any questions about this product by VitalityVille, contact us by completing and submitting the form below. If you are looking for a specif part number, please include it with your message.